Heat gas or charcoal grill for indirect cooking. Remove pie crust from pouch; unroll on inverted metal pizza pan. 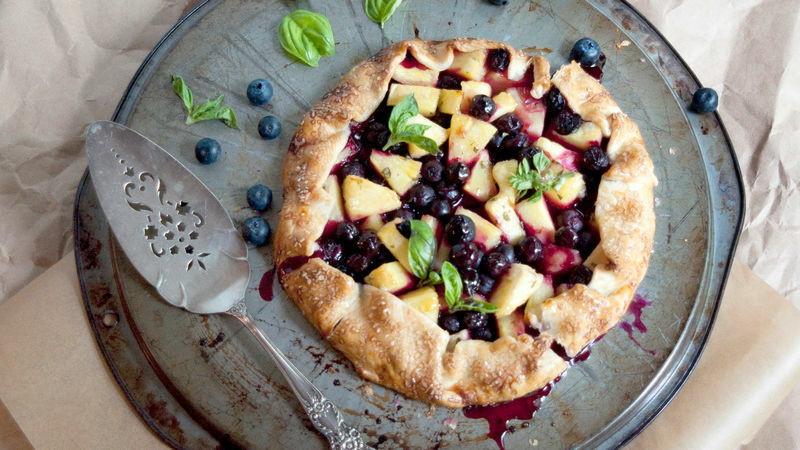 In medium bowl, toss pineapple, blueberries, flour, chopped basil and 3 teaspoons of the sugar until fruit is well coated. Brush crust with half of the melted apple jelly. Mound fruit mixture in centre of crust to within 2 inches of edge. Bring crust up over filling, creating freeform rustic edge. Brush crust with egg. Sprinkle with remaining 1 teaspoon sugar. Place pizza pan on unheated side of two-burner gas grill heated to medium-high. (For one-burner gas grill, place pan on grill over low heat. For charcoal grill, move medium-hot coals to edge of firebox; place pan on grill rack.) Cover grill; cook 30 to 35 minutes or until crust is golden brown and filling is bubbly. Cool 5 minutes. Just before serving, brush fruit with remaining melted apple jelly. Garnish with basil leaves. Cooking the galette on the underside of the pizza pan makes it easy to remove it when you’re ready to serve—simply slide onto a serving plate. To make preparation easy, purchase freshly cut pineapple from the produce section of your grocery store. Don’t let the pie crust get too warm while you work, or it can become difficult to handle. If it seems to be getting too soft, just put it in the refrigerator for a few minutes.